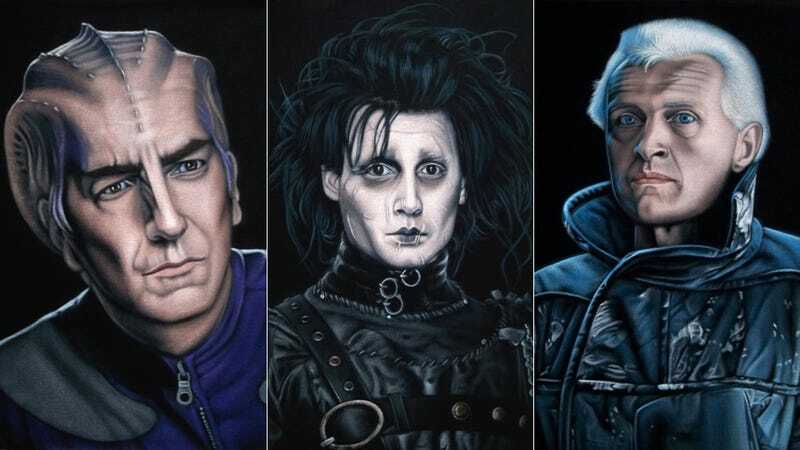 Your Favorite Science Fiction Characters Brought To Life...On Velvet! There’s nothing more fun than looking at paintings and other artworks showing our favorite characters from science fiction. Except maybe... when they’re paintings on black velvet? Meet Bruce White, who depicts your favorite characters with the vibrance and luster of velvet Elvises. We’ve featured White’s paintings before, here and here, but now he’s got a brand new gallery show at Gallery1988 in Los Angeles. And a whole bunch of new velvet paintings for sale. Not to mention, he’s just launched a new website, VelvetGeek.com. So we’re happy to share some of his latest works with you, in all of their velvety smoothness. Including a Blue Velvet character on black velvet! Vigo the Carpathian—watch out for this painting. It might have a nasty surprise inside!